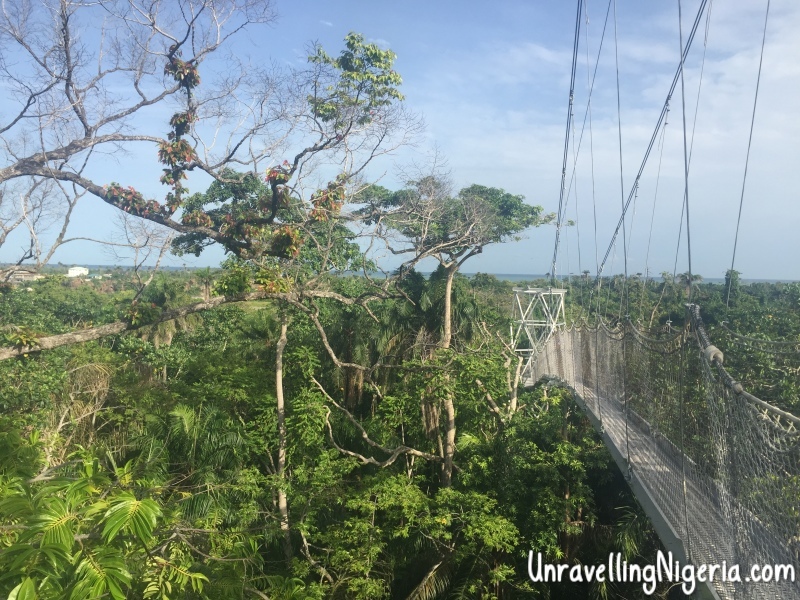 Imagine my excitement when I was told that Nigeria is currently home to the longest canopy walk (401m) in Africa, and the second longest in the world. I couldn’t wait to go have a look. On Democracy day after our President got sworn in, I grabbed my brother and went to see it. If you’re adventurous and looking for something to do, go for it. My only advice is hold on and don’t look down! After the guide showed us the new features of the centre which included ponds, floor games and the family park, we were asked if we would want to go on the canopy walk. Best believe I was one of the few people who said yes! The canopy walk has six rest stops. After each stop, the walk is elevated higher till you get to the highest point after which you start descending down. It was exhilarating and I was scared but it was worth it. The view also beats that of the tree house on the site which is now closed. I made a couple of new friends and we played in the family park later on. However we all agreed that the canopy walk stole the show that day. A few changes have occurred since I went there last year (minus the canopy walk/games). A guide leads you through the nature walk unlike last year where everyone was left to figure it out. However I think the guides should put in more effort. They lead you through the walk in silence without explaining or talking on the places passed. This in my opinion makes the guides useless. To make it a bit more interesting, perhaps a little history of the nature walk could be given and an explanation of the various segments. I’m sure people would love to know. This would mean having trained guides, not just picking random people! Tickets are now given when you pay, which is great because you have some sort of proof of payment. Last year this wasn’t the case and led to unnecessary arguments. Food can be taken in and eaten at the family park. Of course you have to clean up after yourself. It remains a wonderful place for a quick getaway especially for nature lovers. However, I hope more animals and games can be added. I do understand that because it’s a nature walk and not a safari, there can’t be a lot of animals there. The entry fee still remains N1000 (3 GBP/4 EUR/$5). Parking is available and food can be take in. Those the 1k give you access to all d facilities? How do you return to the starting point when you get to the end of the canopy walk?? It has 2 entry points so you can get off at either side. Going with my family and friends to have my birthday get-together, can We play a cool music????? Previous Previous post: To Camp Or Not To Camp, That Is The Question!